May, 2017Congratulations to our Leeds Half Marathon finishers! A sunny day dawned on Sunday 14th May, and the time was finally here to put those months (or for some, weeks) of training to the test. Following a few last minute injuries and drop-outs, a team of 14 intrepid runners lined up with a mixture of nerves, excitement and a willing for it all to be over! With the help of Met supporters positioned around the course, cheering on the team as they passed, the first runner home was engineer Matthew Young, in a time of 1:35:24, with surveyors Piotr and Dave B following close behind in 1hr 49 and 57 seconds respectively. In a little over 2 hours and 17 minutes after the starting pistol, the final Met runner crossed the finish line, making it 14 out of 14 successful half marathons completed, and an average team finish time of 2:01:15. It was all over, and time for some much needed rest, recovery and replenishment, with a traditional Met Consultancy Group BBQ! Thanks also go to Director, Neil Harvey, for providing food, drink and being the chef at the BBQ, and to all the supporters who turned out to cheer the team around the course, and provided a shoulder to lean on when legs seized up later! 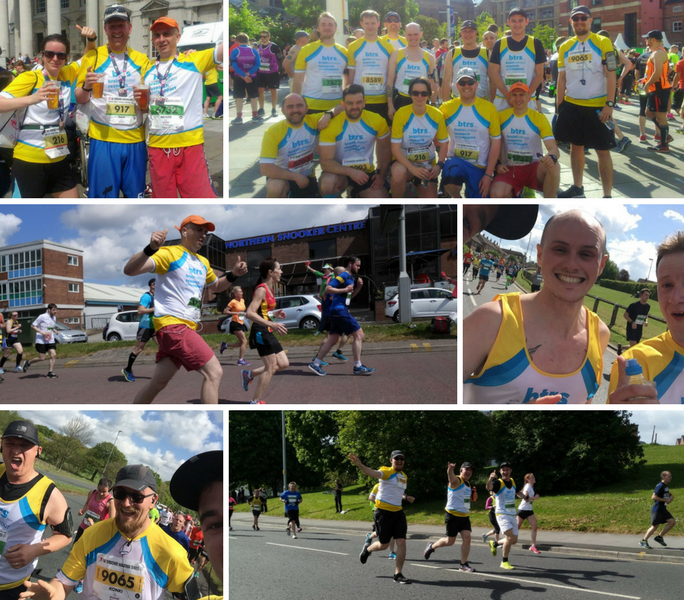 Comments Off on Congratulations to our Leeds Half Marathon finishers!